It’s just hit 5am and I’m in a taxi heading to Adelaide airport. The taxi driver is looking at me sideways, thinking that I must be crazy for wearing shorts in this weather. What he doesn’t know is that last night I passed out fully dressed due to sheer exhaustion in the house of a generous stranger. I’d come to that house straight from an after-party, after coming straight from the biggest rally in Adelaide’s recent history, after coming straight from one of the greatest things I’ve ever done- a two week walk of over 300km with 60 other people. But I’m getting ahead of myself; we need context. The starting point of our journey was a little South Australian town called Port Augusta, known for its two coal-fire power stations, Northern and Playford B. Despite billions of dollars in fossil fuel subsidies from the federal government, these stations have become uneconomical and are shutting down. A report by Beyond Zero Emissions, a think-tank of engineers and scientists, has concluded that the best way to replace this energy capacity is with concentrated solar thermal (CST). You may have heard of this technology, or at least seen a picture. It looks like a big field of solar panels arrayed around a tower. These panels are actually mirrors, and their job is to focus sunlight onto the tower, where molten salt gets heated to 565°C. This heat is used to boil water, which generates steam and turns a turbine- just like in conventional coal-fire stations. The huge advantage of CST over other renewables though is that the molten salt can be pumped into a storage vat, where the heat is retained for up to 16 hours. It is then drawn from as needed, meaning that electricity can be generated constantly, even when the sun isn’t shining. Several CST plants are currently operating in the United States and Spain, with countless more being rolled out globally. Port Augusta is the ideal location for Australia’s first such plant because the town is sunny, the necessary transmission infrastructure is already in place and there’s a skilled workforce available. A survey of the Port Augustan community found that over 98% of residents are in favour of constructing CST rather than the alternative, a gas-fire station. The local council and state government are supportive, as is Alinta, the company that owns the Northern and Playford B coal stations. CST plants are cheaper than gas over a 30 year period, create more jobs and are not subject to resource availability. The only barrier to this amazing opportunity is the upfront cost of ~$1.6 billion, which would have to be subsidised by the government. The future of human history is a massive boulder rolling down a mountain. There’s an incredible amount of inertia, and it’s almost impossible to knock the boulder off its business-as-usual course. But occasionally, there comes a moment where there’s a jut in the path. If enough people push hard enough at just the right time, the entire trajectory of the future can be shifted. Build one CST plant, establish an industry, and the next ones become cheaper and cheaper. Port Augusta could just be the domino that accelerates Australia down the path to 100% renewable energy. Our mission therefore was to make Port Augusta a national issue. The best way we could think to do this was by marching all the way from Port Augusta to Adelaide, talking to everyone we met along the way, generating as much media attention as possible, and bringing the message to the doors of Parliament. This story is really the stories of the amazing people who walked alongside me. Our group spanned the age spectrum, from an adorable 5 year-old girl right through to the retired, self-proclaimed “oldies”. Interestingly age hardly seemed to correlate with life experience or philosophy. I spoke with a fascinating Polynesian man, born in New Zealand, who moved to Australia, was adopted by an Aboriginal family and became a professional Indian dancer. I heard the story of a girl who was born in Greece while her parents were sailing around the world and spent the first year and a half of her life at sea, later living in a shed, on a boat again, and in South Africa for a year. I met a lovely German woman who moved to Australia 30 years ago, became a masseuse, and in her spare time makes huge works of art out of materials that to other people look like rubbish. I chatted with a guy who resents being called an “environmentalist”. The word invokes images of unwashed hippies, anti-progress libertarians, naive youth. He pointed out that our group was not those things. We were primarily university-educated, relatively well provided-for mainstreamers. It is possible, perhaps even common, to be concerned about climate change because of the human impact, without necessarily caring at all about the “environment”. This was his situation and pretty much mine as well- I see climate change as a utilitarian concern. It is the global issue with the greatest propensity to harm human wellbeing, and is thus the most logical problem for a general altruist to tackle. I spent a lot of time questioning why the individuals in our group possess such altruism. Maybe it’s some reciprocity instinct, maybe it’s a natural behaviour once one’s basic needs are met, or maybe I just have to accept that it’s a random psychological quirk some people have. Whatever the reason, the question was beyond me. At some point my mind flipped. I suddenly felt I was gazing down at the stars instead of looking up, and awe filled me as I vividly pictured myself plummeting from the face of the earth. Later that balmy night our camp was hit by gale-force winds. Unable to sleep for the constant flapping of tent in my face, I emerged to meet a Tasmanian and a Sydneysider whose tent had caved in. We dragged our sleeping gear out behind the food van for shelter, and had almost fallen asleep when two huge metal marquees were ripped from the ground and almost crashed over the van onto us. The ensuing scene was how I imagine it would be aboard a ship whose mast has just been destroyed by lightning. There was confusion, flashing torches, people shouting and rushing and trying to dislodge the billowing sail that the marquees had become. In the grey morning a double rainbow crowned the twisted wrecked metal frames. Blisters become obsessions. A few days in, conversations subtly shifted from complaining to stoicism, and people started enquiring about each other’s feet instead. As the trip wore on some people had whole toes turn into squishy masses, while others clandestinely practised lancing (I won’t mention which camp I was in). By day thirteen I saw blisters the size and shape of grapes, sometimes filled with blood or marbled where blister had grown upon blister upon blister. A visiting first aider warned of permanent scarring and compared some of the worse ones to second degree burns. If anything, I suspect his words hardened resolve. We slept in fields, in paddocks, beside train tracks and highways, in farm sheds, a shearing shed one night, on stony ground, between bushes, around camp fires. In the second week several tents were destroyed by wind, mine included, and we discovered what it feels like to become climate refugees, sheltering in the backs of vehicles or huddling together in a chicken barn. Somehow the adversity increased the thrill, increased the sense that any challenge could be overcome to make this campaign successful. 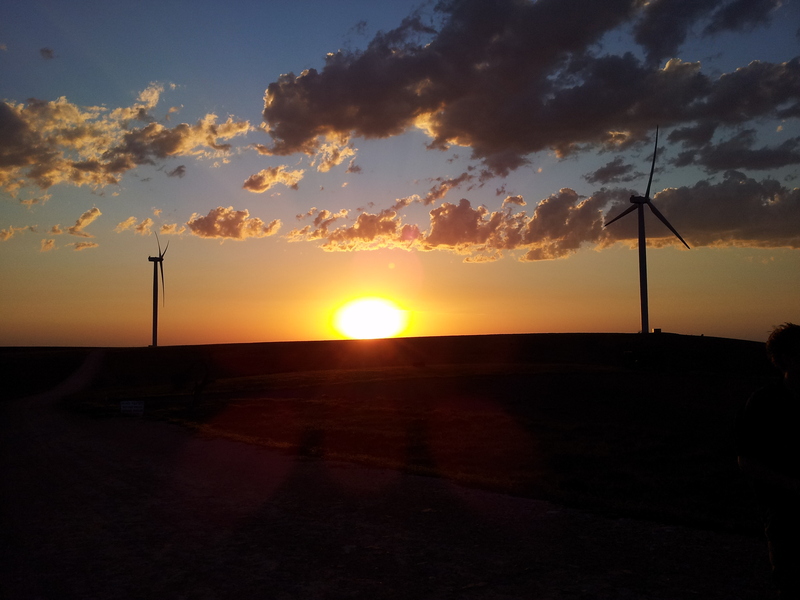 On the seventh afternoon we climbed the ranges outside Snowtown, and in the glow of a golden-red sunset, reached the giant wind turbines at the summit. This was possibly my most euphoric moment of the whole trip. Having previously only seen turbines from a distance, I’d often wondered at the thinness of the blades- how could that flimsy surface area be the best design for catching wind? But up close, the beauty of their subtle curve and tapered edges dazzled me. They reminded me of aircraft; creating lift with the same elegance as wing foils and turbine blades. I no longer doubt their exquisite engineering. Apparently in Victoria it’s illegal to build a wind turbine within 3km of a house. The noise from these turbines was undetectable until we were within a few hundred meters. The sound was comforting, easily quiet enough to talk over, and mostly obscured by the wind. It was saddening to hear of the irrational beliefs in wind turbine sickness, ostensibly responsible for everything from weight loss to cancer. In “Zen and the Art of Motorcycle Maintenance“, Robert Pirsig argues that quality is the union between subject and object. To achieve quality in a task, the trick is not to separate oneself from one’s surroundings. I’ve never tried achieving zen. But when you’re walking for 5-6 hours, day after day through beautiful fields with mountains in the distance, it tends to find you. At times I reached a state of existing purely in the moment, almost a part of the landscape. The future was unknown and didn’t matter, the past forgotten; awareness of my aching feet faded. I forgot my destination and even my reason for being there. The mere act of walking became purpose, and brought with it a soft glowing inner happiness. If that is zen, I can tell you it doesn’t lead to any blinding epiphanies. But over time, and interspersed with conversation and reflection, nebulous inklings and feelings solidify until they become amazingly clear; you come to understand yourself. I had a fascinating conversation with a grain farmer. He spoke with revulsion about the “fake farmers” who raise battery hens on growth hormones. A true farmer has reverence and pride in what he grows, he doesn’t defile nature in the pursuit of money. This farmer was unexpectedly positive about wind turbines, and suggested that many farmers are actually jealous of them- energy companies pay several grand a year for each turbine on your property and they require no maintenance. He aggressively told me to wash my mouth out when I asked whether any of his crops were genetically modified. He had an ideological hatred for Monsanto which seemed to transcend the necessity for rational explanation. It’s a sentiment often voiced even by liberals, and something I find particularly frustrating as a geneticist. Having had a vague background in pest management, I asked out of curiosity which insecticides the farmer uses. This was a mistake and caused him to clamp right up. I wish I knew how I’d offended him. On the seventh night we formed a sharing circle around the campfire and opened up about why we were here. I’ve never felt closer to a group of people. I wish I could repeat everyone’s stories here in detail, but sadly it’s not my place. I hope though their owners keep finding the courage to tell them. It came out that many in the group had gone through true hardship. Someone had been in the CFA and had their first call-out during the Black Saturday bushfires. They experienced first-hand the unapproachable heat of that inferno and saw the devastation of everything in the community afterwards- the land, the homes, the people. Someone had been the victim of police brutality; someone else had spent time in Kenya helping AIDS sufferers. We heard from a civil engineer who’d left his job in the coal industry two years ago because he could no longer live with the moral compromise. Others had left jobs for similar reasons. Several people had gone through periods of despair, anger, even clinical depression, brought on by the magnitude of fighting climate change and the sense of isolation. A father in the group brought up that it takes a whole community to raise a child, and that’s when it hit me: we were a community. I looked around at the fire-lit faces, most of which I’d never seen prior to this walk, and realised that I trusted and cared for them all, would fight for them. Together, we were the remedy to our problems. We needed each other, and now here we were. It was an incredible feeling. That same night, hearing everyone’s most private moments, I kept asking myself: why? Why why why, why am I here? Utilitarian rationalism wasn’t a good enough answer. People’s stories about family got me thinking about my own and especially my mother. She was the one who had taken me when I was still in high school to see An Inconvenient Truth; the film that had opened my eyes and finally given me a cause. I’d always credited that film with changing my life, but just then something deep inside me cracked, and I realised I’d been missing a crucial point all this time. It wasn’t just the film; it was also my mother, the person who had taken me there, who’d sacrificed so much to raise me and who had instilled me with her values. Suddenly I could see her from decades ago, from long before I was born, when she was still an activist with Friends of the Earth, fighting passionately in the Save the Whales campaign. At the time it was the most important issue for my mother- something which didn’t directly affect her in the slightest. Despite this, despite it being a different species, it was worthwhile. Maybe I’d just answered my altruism question. It was as simple as compassion. If you have compassion, or can be taught it, the rest falls into place. And then I knew why I’d come there, to that dark farm in the middle of nowhere. It wasn’t because Al Gore had told me to. It was because my beautiful mother had taught me to care beyond myself. She was getting older now, but I had taken up the torch and would carry on her same struggle with everything I had. As the airport comes into sight I glance down and catch sight of a scar on my pinky that I got on the second day. The support vehicle had blown a tyre and I scratched myself on the shredded wire inside. Who knew tyres have wire in them? I watch the sodium lights play across my tanned arms and wonder whether this time it’s real, or just more engrained dirt and sweat and sunscreen that will wash off in the shower. It’s going to be difficult reintegrating into society. I’ll have to keep reminding myself that in the real world it’s not acceptable to casually urinate on a bush in broad daylight. Nor is it the done thing to poke at a friend’s wound, or enthusiastically discuss your bowel movements- although, on that note, there’s something weirdly satisfying about digging your own hole to poo in and covering it afterwards. Cats are definitely on to something. I’ve toyed wistfully these past few days with the idea of quitting my job. I can’t see how I’ll be able to endure it now that I’ve experienced something that feels so real and meaningful. I’m trying to remind myself that everyone has to work a job to get by and you’re damn lucky if it’s not menial. Similarly, now that I’ve met so many amazing like-minded people, I’m not sure I’ll be able to keep my values to myself as I’ve done for years. How can I explain to my work colleagues or friends what this experience meant? Apathetic selfishness will once again infuriate me. I suppose the feelings from this walk will fade over time as I return to normality once more. But whatever happens, I vow to keep a secret flame going inside me, for my new family, and for the journey we shared.